Workshop Item Skins - Workshop Feature Suggestions - PixelTail Games - Creators of Tower Unite! Currently, if you’d like to make for example a custom computer monitor that displays different things on each monitor or a car with different paint jobs, you’d need to upload a separate model for every variation of the texture(s). I think it would be great to have a system similar to Garry’s Mod in that you can place a model, and after placement can change the texture to different variations from a pre-defined list made in the workshop editor. 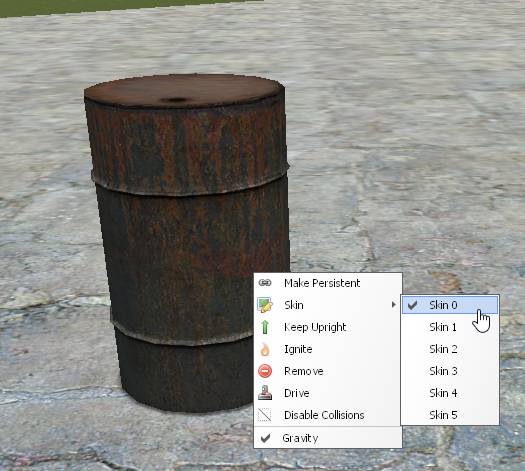 In this case, the barrel can be changed to allow for different colors (in gmod). Each “skin” could have a maximum of 2 or 3 materials (if using the skin system) and there would be a maximum of 10 or so skins for a model (if I recall correctly the reason for the material limit isn’t for file size, but due to optimization/rendering so quantity of textures isn’t as much of an issue?) Of course said workshop model would still need to comply with the file size limit. This would allow for a very flexible means of using a base model and applying variations in the model while not having to upload a new model each time. It works great in Garry’s Mod, and I think it’d work great here! Yeah, i suggested this as well, and totally agree. +1 vote, could be used for toonshaders on playermodels as well. Ye, I could bundle up a couple of model variations I got into a single entity.